Results-oriented people are revered in our culture. We want to hire the guy who can get the job done. Baseball general managers negotiate to bring a .325 batting average to their mix. We’ve been conditioned to love results with gold stars and praise for achievement. But what happens when all your hard work doesn’t lead to the results you want? Do you feel like a failure? Do you accuse others of failing when they don’t make the right result happen? Maybe it’s time to take a new approach to failure that can lead to great success. 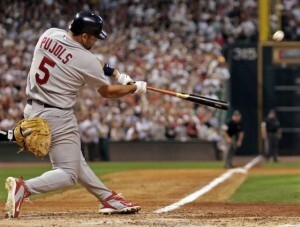 Albert Pujols, the St. Louis Cardinals’ phenom, carries about a .310 batting average. He practices hitting continuously, polishing his processes of eye-hand coordination, strength, and strategy. He does this to improve the odds that he will get the result he’s paid handsomely to get. Here’s some Learner/Researcher data: Albert Pujols fails 69% of the time. Can his management expect him to step up to the plate and produce a hit? In a month of practice, he may nudge his average up to .320. That improves the probability that he’ll get a hit a particular time at bat, but it doesn’t guarantee it. Sonny Jurgenson, legendary quarterback for the Philadelphia Eagles and the Washington Redskins from 1957 through 1974, was as unemotional as they get when it came to results. Watch any video of Jurgenson throwing a pass, and I challenge you to determine if the ball was missed, intercepted, or resulted in a touchdown. Jurgenson was all about processes, not results. Depending on the consequential result of his processes at the moment, he would return to the huddle and decide to keep or change his process. What result are you stressing over? Do you manage a team? Please stop punishing people, pointing fingers at their failures from your Knower/Judger judgment of an unfulfilled result. Punishment works to stop the behaviors of five-year-olds so other behaviors can be supported. It’s my experience that it doesn’t work so well with grown-ups. Instead, turn the result into a stepping stone to success by exploring the process(es) that led to the unmet expectation. What can you change that might lead to a different result? Here’s the bottom line: You can’t manage the result. You can, however, use your Learner/Researcher to manage process by analyzing the process that led to your “failure” and making changes that might create a different outcome. Instead of trying to make the result happen, manage the supporting behaviors and resources and simply let the result happen.